A model presents a creation from British designer Victoria Beckham during their 2019 Autumn / Winter collection catwalk show at London Fashion Week in London on February 17, 2019. 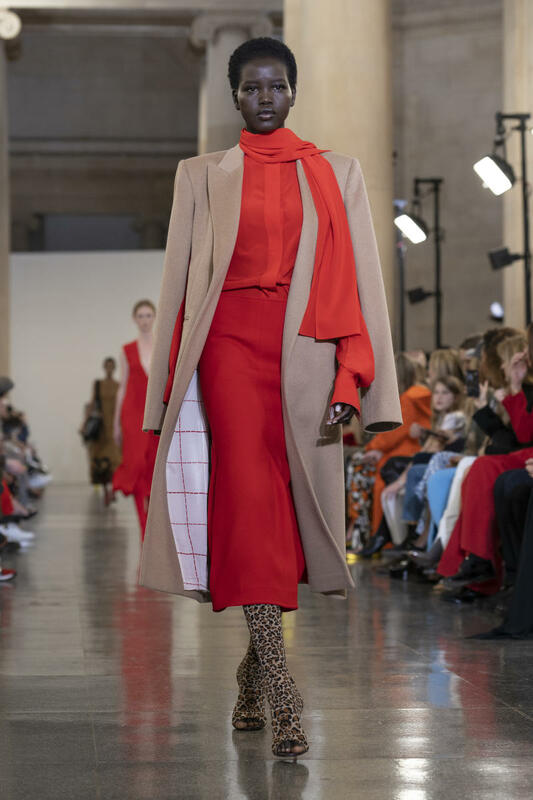 Exaggerated collars, leopard print and a strong colour palette: British designer Victoria Beckham turned to "pinches of the '70s" as she showcased her latest collection Sunday at London Fashion Week. The former Spice Girl chose the rarified galleries of the Tate Britain museum, a neoclassical building home to some of the country's most treasured art, for only her second catwalk show in the British capital. "I have been thinking about what women want, about modern femininity," she told audiences in show notes describing her autumn/winter 2019 collection. "There are touches of retro, pinches of the '70s. Yet it's all brought together into something encapsulating what we call the modern feminine alphabet," the 44-year-old said. The audience was as expected packed with fashion industry celebrities, including Vogue magazine heavyweights Anna Wintour and Edward Enninful. Meanwhile her family, from husband David Beckham to kids Romeo, 16, Cruz, 13, and seven-year-old Harper, were front row to show their support. Beckham celebrated a decade of her brand -- previously only exhibited in New York -- by showcasing in London for the first time, in the autumn of 2018, in a homecoming of sorts. "The studio is based here, as is our flagship store, and I felt I wanted to continue to be a part of London Fashion Week," she told The Guardian of the decision to feature in Britain again. This time around the designer said she wanted to accentuate "lots of colour, lots of pattern" in her collection, with a bold palette ranging from absinthe green to lipstick red, dusty pink to pale teal. Tweeds, wools and silks were "matched and mismatched", in everything from blazers and trousers to sweaters and scarves, alongside a plethora of high-heeled boots, closed or open-toed. "Throughout, there is a celebration of the inherent femininity of dresses -- ideas of their past, and proposals for the future," the designer explained in her show notes. Despite being a respected figure in the fashion landscape, Beckham is still sailing in troubled financial waters, with losses rising to £10.3 million ($13.3 million, 11.7 million euros) for 2017, according to figures published in December. Meanwhile after the show, while her crew packed up, around 20 activists from "Extinction Rebellion", a civil disobedience campaign group focused on climate change, blocked traffic in front of the museum to raise awareness for the cause. Dozens of protesters also targeted the main fashion week venue on The Strand in central London as they called on the industry to do more to reduce its impact on resources. "We are in an ecological emergency and we need all sectors of society to tell truth about that, and that especially includes the cultural sectors who are some of the best communicators," Clare Farrell, one of the organisers, told AFP.